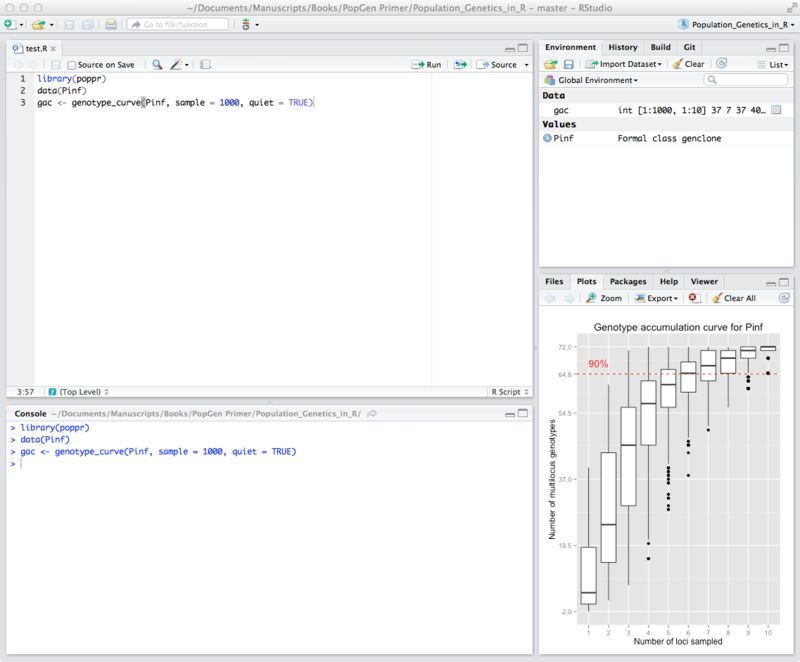 This appendix introduces basic use of the R statistical and computer language and the RStudio Desktop integrated development environment (IDE). 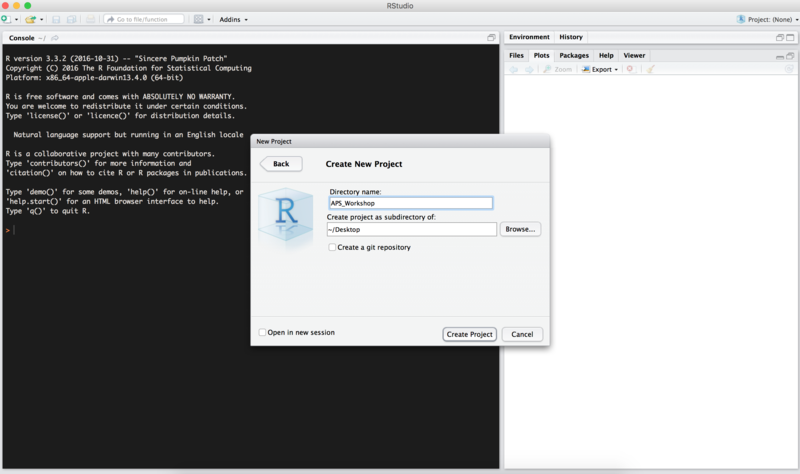 We assume you installed the needed resources mentioned in chapter 2 on getting ready to use R.
Warning: To install R and RStudio you might need administrator privileges. Contact your IT manager and ask for an R installation or administrator privileges. Note: the “>” symbol is R’s prompt for you to type something in the console. You just assigned the value 1 to the variable x with the assignment operator <-. The second command asks R to show the value assigned to R. Finally, the top right panel shows variables loaded into the environment and the bottom right panel is useful for loading files, plotting graphs, installing packages and getting help. Feel free to explore all the various tabs or elements of each panel. This is very useful when developing reusable code or when you want to remember a few months later what you actually did. Note that we use quotes to denote the string data type containing text. Coding projects usually results in a vast number of files, datasets, scripts and figures that can be difficult to manage and keep organized. RStudio has created the RStudio projects to facilitate and simplify the management a project by associating all of the project files into a working directory of your preference. This means that all script files, datasets and results of a project can be stored in a set location to facilitate access and management. And there is your new RStudio project withing the APS_Workshop directory! We can start downloading the required files and scripts for the workshop into that folder. RStudio has a very useful feature called code completion using the Tab key which can complete the full name of an object. For example type hel and hit Tab and you will see several functions pop up and you can select help(). This also works inside a function to find function arguments. Type help( and hit Tab to select arguments for the help function. RStudio records your command history. Thus you can scroll up or down the history of executed commands using the Up or Down arrows. Make sure your cursor is in the console and try to re-execute previous commands. 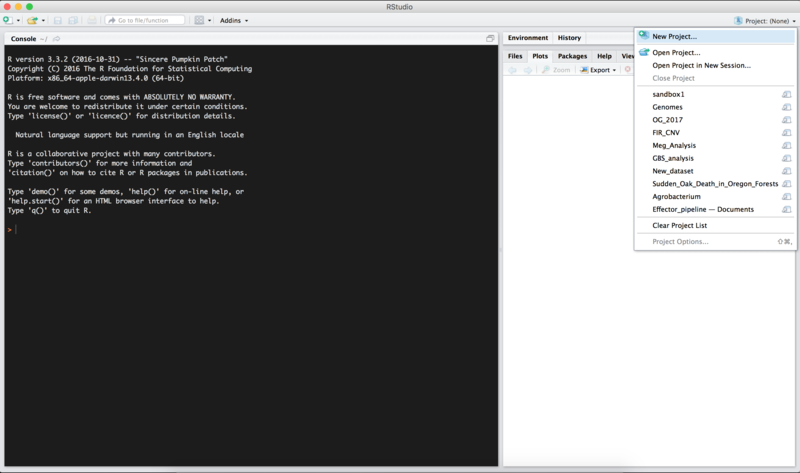 To quit R you can either use the RStudio > Quit pull-down menu command or execute ⌘ + Q (OS X) or ctrl + Q (PC). Some examples demonstrating its usage. help(package = "poppr") # Get help for a package. help(amova)             # Get help for the amova function. ?amova                  # same as above.
? ?multilocus            # Search for functions that have the keyword multilocus. browseVignettes(package = 'poppr') # see vignettes from a specific package. Swirl is a very well thought out R package that teaches you interactively. Code School Try R is a nice interactive tutorial. R cookbook is a nice quick reference and tutorial for general R use. ggplot2 book is a useful reference if you want to customize graphs for publication.